Ms. Pel has more than 30 years of experience as a strategic business advisor, both as an executive and as outside counsel. She has extensive expertise in governance, securities regulatory and policy matters, and corporate, commercial and securities law. Ms. Pel held the role of Senior Vice-President, Group Head Legal and Business Affairs at TMX Group until 2015, where she was responsible for advising the TMX board and executive management on all aspects of its governance, operations and legal and regulatory affairs. Prior to that, she was a partner at Torys LLP. Ms. Pel currently provides consulting services through her firm, Inglewood Advisory Services. OPTrust’s 10-member Board of Trustees has overall responsibility for the administration of the Plan and the management of the assets to ensure OPTrust can deliver retirement security to its almost 90,000 members, pensioners and their dependants. Read more. The OPSEU Pension Plan is funded from three sources: member contributions, employer contributions and investment returns. On average, out of every $1 a pensioner receives, 73 cents is generated by investment returns. OPTrust remembers Fred Upshaw, one of the Plan’s founding sponsors, who passed away in March. Mr. Upshaw was the first African Canadian person to lead a major Canadian trade union serving as President of OPSEU from 1990 to 1995. The culmination of years of hard work and discussion between OPSEU and the Ontario Government to create OPTrust began during Mr. Upshaw’s leadership – leading to retirement security for almost 90,000 members and retirees today. Mr. Upshaw’s contributions were many, and he will be greatly missed by all who had the privilege of knowing him. Are you as passionate about pensions as we are? At OPTrust, we are pension people and believe strongly in the unique value of the defined benefit (DB) pension model. But not everyone is aware of the value DB pensions deliver to workers, employers, the economy and Ontario communities, and the long-term social and economic benefits of ensuring retirement income security for all Canadians. We’ve launched our People for Pensions program to spread the word about the positive aspects of DB pensions from the pension people that matter most: our membership. OPTrust’s People for Pensions program is designed to create an informed, educated and connected community among our members and retirees to promote the DB pension model. The program will ask our membership to become a People for Pensions member to share information with their peers, friends and families about the value of DB plans like the OPSEU Pension Plan. What can I expect as a People for Pensions member? OPTrust will send you information that you may use to discuss with your friends, family and colleagues. Some People for Pensions members may use the information in casual conversations while others may want to share the information through their social media channels. The goal of this initiative is to inform people about the value of workplace DB pension plans. How will I get information about pension issues? OPTrust communicates its People for Pensions program through a dedicated website, an e-newsletter, as well as social media channels like Facebook and Twitter. We will share information about how DB plans like the OPSEU Pension Plan help to provide a secure retirement. Do I need to be a pension expert to be a People for Pensions member? No! Being a People for Pensions member means you’re interested in learning more about your own plan and how DB plans are a value to both members and the economy. You are not expected to be an expert on the details of pension plans. In fact, we ask that you contact OPTrust regarding any detailed questions about the OPSEU Pension Plan that you or others may have. We invite you to learn more at peopleforpensions.com and to become a member! 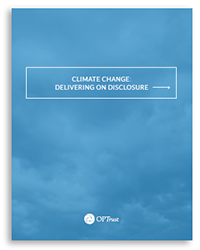 In January 2017, OPTrust released Climate Change: Delivering on Disclosure, a position paper that details the fund’s approach to navigating the complexities of climate change with respect to institutional investing and includes a call for collaboration in the development of standardized measures for carbon disclosure. We have been active in the conversation around climate change, and now is the time to take the next step. OPTrust’s approach to climate change is rooted in its investment beliefs and strategy, which recognize that environmental, social and governance (ESG) factors will impact the fund’s investment risk and return decades into the future. For pension funds, climate change presents a number of complex and long-term risks. In Canada alone, pension funds manage well over $1.5 trillion in assets, which brings a real responsibility to collectively seek innovative approaches to modelling carbon exposure and its impact across portfolios. Read the full paper. At OPTrust, our members count on us for one thing: a stable and sustainable pension that they know will be there for them in retirement. Ensuring we can pay pensions today and preserve pensions for tomorrow is our mission each and every day. Our Responsible Investing (RI) program helps us to deliver on this promise, by further aligning our investment strategy with long-term environmental, social and governance (ESG) factors. We are committed to reporting our RI program to you and to outline how the fund invests. Read our 2016 Responsible Investing Report for a snapshot of key highlights during the year together with our long-term RI strategy. If you are planning to move soon, don’t forget to give OPTrust your new mailing address and any changes to your phone number, email and banking information. That way we can continue to send you important information about your OPSEU Pension Plan. You can update your new information by contacting Member Services at 416 681-6100 or 1 800 637-0024. Our evening seminars are tailored for members who are within 10 years of retirement, but all members are welcome to attend. View upcoming sessions at optrust.com. Unable to attend an information session? You can still get the information you need by either viewing our posted presentation or signing up for a live webinar from the comfort of your home. The same information is covered as an in-person session and if after viewing it you have questions or need help with your retirement, please contact us. Sign up online at optrust.com, or call us at 416 681-6100 or 1 800 637-0024. Featuring highlights of OPTrust’s efforts over 2016 in remaining fully funded – the measure that matters. Read the report.